Herndon, VA — The most successful European car of all time turns 40 this year. More than 30 million Golf models have been sold since the car went on sale in May 1974 in Europe and in December of that year in the U.S (as the Rabbit). Seven generations later, the successful formula remains the same: crisp, elegant styling; space-efficient packaging; frugal yet powerful engines; and entertaining front-wheel-drive handling. 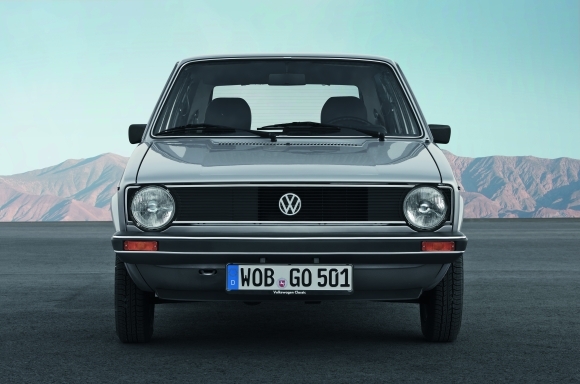 When debuted, the Golf marked a revolution for Volkswagen. The car’s water-cooled inline engines were placed transversely, driving the front wheels, whereas the Beetle’s air-cooled, horizontally-opposed engine lived at the back, driving the rear wheels. The car was very successful in the U.S., selling more than 100,000 units in its first full year from February of 1975, the best of any new import. From 1978, Volkswagen built the Rabbit in its Westmoreland plant in Pennsylvania, selling 215,000 vehicles in 1979, an increase of 44 percent over the previous year, in a market that shrank overall by six percent. Before Golf production was relocated in 1988, the Jetta sedan had assumed the role of sales leader in the U.S. market. The Golf, however, remained technically and visually related to the Jetta and has thus always been a part of the sedan’s success in this market. And the GTI—which invented the term “hot hatch” when it was launched in Europe in 1976—has remained one of the most popular compact sporty cars on the market. In fact, the U.S. is the largest single market for the iconic hot hatch. The first full-production Golf rolled off the line in Wolfsburg in March 1974 and was in German Volkswagen dealerships that May. The Golf wasn’t the first VW to have a transversely mounted engine driving the front wheels, however: the K70, a design taken from NSU, was first, followed by the Scirocco and the Passat. 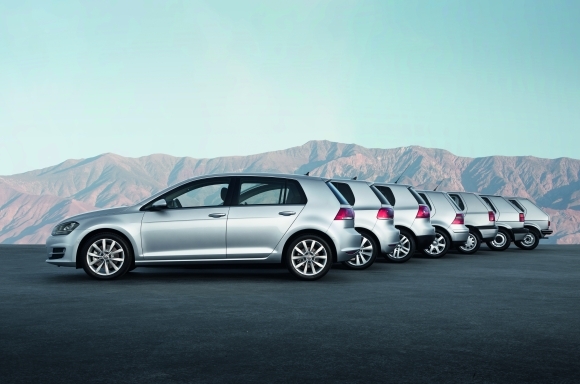 With the launch of the Golf, the new technology found its way into Europe’s highest volume vehicle class. 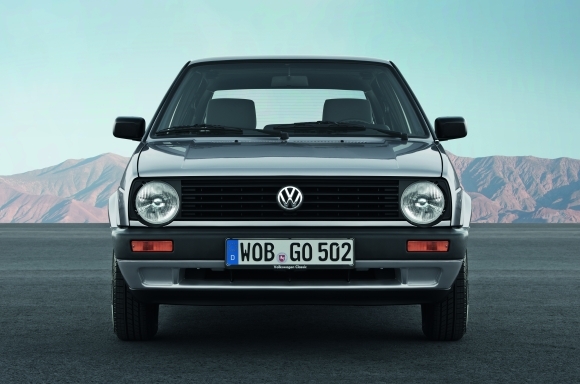 The Golf had a big task to fulfill: taking over from the Beetle, the world’s most successful car at the time. However, the combination of Giorgio Giugiaro’s design, the spacious interior, the car’s practicality, and its enjoyable handling won the market over to such an extent that the one-millionth Golf was produced in October 1976. In July 1978, production of the Rabbit started in a new plant in Westmoreland, Pennsylvania. The Rabbit models produced in the U.S. differed from their German Golf cousins in having square instead of round headlights, larger taillights, color-matched interiors, and a softer suspension. The Golf was an innovative force in the compact hatchback class. The original GTI invented the hot hatchback in 1976, while the later Golf GTD turbodiesel marked a breakthrough for diesels in this segment. In 1979, the Golf convertible brought a breath of fresh air into the category, debuting in the U.S. as a 1980 model, powered by a new fuel-injected 1.6-liter four-cylinder engine rated at 76 hp and mated to a standard five-speed manual transmission or an optional three-speed automatic. While the convertible was made in Germany, virtually all other 1980 Rabbit models were now made in America—including the pickup. Over time, the Rabbit received a larger 1.7-liter engine rated at 74 hp and a 1.6-liter, 52 hp diesel. And, of course, the GTI made its debut in the US in 1983, featuring a 90-hp, 1.8-liter version of the fuel-injected four-cylinder engine. The global sales figures added up: Volkswagen sold 6.99 million first-generation Golf models. In the U.S., about 1.5 million Golf derivatives found buyers. The Golf had proved itself a worthy successor to the Beetle. Klaus Bischoff, Chief Designer for the Volkswagen brand since 2007, says: "The step from Beetle to Golf was truly revolutionary. Creatively, the Volkswagen designers changed from a round to an angular form, thanks to Giorgio Giugiaro’s legendary design. The main design elements of the Golf I, such as the silhouette of the upright, massive C-pillar, the prominent wheelarches, and the horizontal front with a slim grille and downwardly protruding headlights are in every Golf to the present day." The second-generation Golf introduced the catalytic converter (1984), anti-lock braking system (1986), and power steering to the compact class. An all-wheel-drive system appeared in the Syncro in 1986. As far back as 1989—some 26 years ago—Volkswagen unveiled prototype Golf models with an electric drivetrain and a hybrid drive system. In the U.S., the market developed differently, with the emphasis on sedans rather than hatchbacks. So, from the 1980 model year, Volkswagen sent the Jetta to the U.S. market and, in the years since, it has been the most popular German car sold in the North American market. Even so, the Golf has been an important component in Volkswagen’s lineup and has been generally marketed under that name since the second-generation car went on sale in the 1985 model year. The standard engine in the U.S. Golf II was a revised version of the GTI's fuel-injected, eight-valve1.8-liter four cylinder, rated at 85 hp. The GTI engine had a slightly higher compression ratio and made 102 hp, while there were two versions of the 1.6-liter diesel: naturally aspirated (52 hp) and turbocharged (68 hp). The convertible continued on the Golf I platform , but was renamed Golf Cabriolet. For the 1987 model year, the GTI received a power boost to 123 hp with the introduction of a new dual-overhead-cam, 16-valve version of the 1.8-liter four-cylinder engine; however, the diesel side lost power because the turbocharged version was discontinued. The previous GTI, using the 102-hp, single-overhead-cam, eight-valve engine, was rebadged as a "GT". The Westmoreland, Pennsylvania, assembly plant was shut down after the 1988 model year and the diesel Golf was dropped from the U.S. lineup. For 1989, production was split between Germany and the Puebla plant in Mexico, but the only major change during the Golf II’s remaining time in the U.S. was the introduction of a 2.0-liter engine in the GTI that produced 131 hp. In June 1988, 14 years after its debut, the Golf had surpassed the magical production milestone of 10 million vehicles. And by the summer of 1991, a total of 6.3 million second-generation Golf models had been produced, of which around 400,000 had been sold in the US. The roots of the third Golf go back to 1985 when the “A3” project—third-generation Golf, A-class—was initiated in Wolfsburg. In February 1987, Chief Designer Herbert Schäfer submitted nine different models of the next Golf to the Board, with the best design being chosen in December of that year. Schäfer said at the time: "In the first step from Golf I to II we made the car bigger, installed more powerful engines, and improved its handling. Now, in the third generation, the design takes precedence. We have found a look that is typical of the Golf: it radiates quality and safety." When the new generation was launched in 1991, its distinguishing features were a slight wedge shape, making it stand out from its predecessor, and a continuous chamfer underneath the window sill. This third-generation Golf brought a new level of passive safety to the compact class when it was launched in August 1991. The Golf III was the first of the series to have front airbags, starting in 1992, while major advances in the car’s body construction resulted in improved crash safety. There were numerous other Golf milestones with the car: the first six-cylinder VR6® engine , the Ecomatic transmission, cruise control, the first oxidation catalytic converter for diesel engines (1991), the first direct-injection diesel engines (TDI® in 1993 and SDI in 1995), and the first side airbags (1996). Also, ABS became a standard feature on all Golf models in Europe in September of 1996. In 1993, Volkswagen also introduced a new convertible, a new all-wheel-drive model (Syncro II), and the first Golf Variant station wagon. 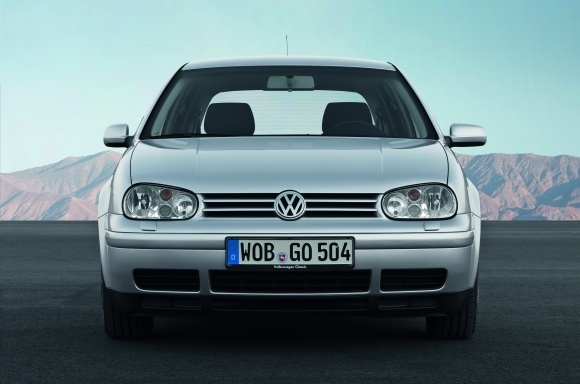 A year later, in May 1994, Volkswagen celebrated production of the 15-millionth Golf. Including all derivatives, a total of 4.83 million third-generation Golf models were produced, with 153,613 finding buyers in the U.S. In the U.S., the 1993 Golf base engine was a 2.0-liter, eight-valve four cylinder rated at 115 hp. The Cabriolet continued unchanged, still based on the old Rabbit chassis, but was replaced by a new car based on the third-generation Golf bodyshell for 1995. That same year, the latest iteration of the GTI went on sale, fitted with the unique 2.8-liter VR6 engine, making 172 hp and 177 pound-feet of torque. The Golf IV was pioneering in terms of its looks and its engineering—and it transcended traditional perceptions of quality in this class. The car also continued to improve safety, with the debut of Electronic Stability Control (ESC) in 1998. The first all-wheel-drive Golf with a Haldex® clutch—the Golf 4MOTION®—also debuted in 1998. ESC became standard in Germany the following year, when the first Golf with a six-speed transmission debuted. This Golf was created under the direction of Hartmut Warkuss, then Head of Design at Volkswagen Group, and is generally accepted as a classic. Nothing was copied from the Golf III; the windshield was flatter, the rear window steeper, and the roof extended even farther back. Giorgio Giugiaro, creator of the first Golf, expressed his admiration for the new car: "The original DNA of the Golf remains evident in its fourth generation." The innovations kept coming. In 2001, the 180-hp GTI was launched to mark the GTI's 25th anniversary, while Side Curtain Protection® airbags and FSI® gasoline direct injection bowed in 2002. The same year, Volkswagen launched the R32; with a top track speed of 155 mph, it was the sportiest Golf ever and the first one to be fitted with a DSG® dual-clutch automatic transmission in 2003. The Golf IV was also the first to be fully galvanized, to feature a navigation system, and to offer Xenon headlights. Including all derivatives, a total of 4.99 million fourth-generation units were produced, of which around 180,000 were sold in the U.S. The fourth-generation Golf didn’t go on sale in the U.S. until the 1999 model year. The base Golf’s power remained at 115 hp, while a 1.9-liter 90-hp turbodiesel joined the lineup. The VR6 returned in the GTI GLX and was now rated at 174 hp and only available with the five-speed manual transmission. The GTI GLS model was fitted with the regular 2.0-liter engine. The Cabriolet retained the 115 hp engine and lasted until the end of the '02 model year, when it was effectively replaced by the New Beetle Convertible. In the middle of the 2000 model year, the GTI GLS was fitted with the turbocharged, 20-valve, 1.8-liter,150-hp four-cylinder engine as standard equipment. For 2002, the 1.8T engine’s power was boosted to 180 hp and a six-speed manual transmission was added with the “337” special edition. In 2003 the VR6 engine was revised to produce 204 hp and a six-speed manual transmission was also added. More excitingly, the all-wheel-drive R32 came to the U.S. for 2004, boasting 240 hp from its 3.2-liter VR6 engine. A limited-edition model, the R32 laid the groundwork for later Golf R32 and R variants. 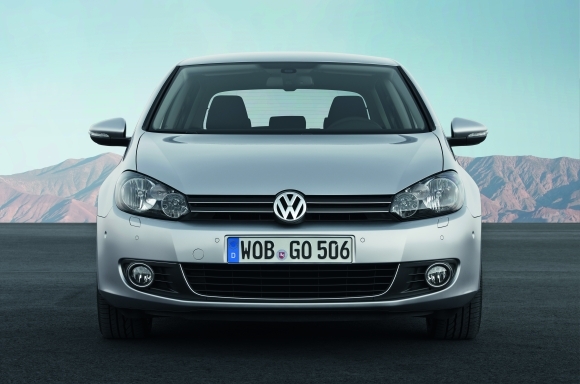 The Golf V upped the comfort, performance, and quality to a level that left many of its competitors in its wake. The new, laser-welded bodyshell was fully 35 percent more torsionally rigid when the Golf V made its debut in 2003. In numerous other areas, the Golf V was a huge advance over Golf IV. There was a new four-link rear suspension; a seven-speed DSG transmission; Bi-Xenon headlights; rain-sensing windshield wipers; the first turbocharged and direct-injection gasoline engine in the GTI (2004); and the 2005 GT Twincharger model featured the world's first supercharged and turbocharged engine. The Golf V’s characteristic C-pillar, powerful rear styling, and sporty front end combined to make the car more dynamic than its predecessor. Marc Lichte, current Head of Exterior Design, remembers the development stage: "The car was higher to get more interior space, but it also became more dynamic as it has even more of a wedge shape than the Golf III. The front end with the integral lighting was a big step." For the first time, the hood followed the contour of the headlights, which were pulled laterally into the fender. Another first were the two-part taillights that extended into the tailgate. New variants of the Golf made the brand attractive to a wider range of drivers. In Europe, the Golf Plus was launched in 2006, the CrossGolf hit the market in 2007, and the Golf BlueMotion® set a new benchmark for fuel efficiency. Including all derivatives, a total of 3.4 million fifth-generation Golf models were produced, of which 144,047 were sold in the U.S. When the car was introduced in the U.S. as a 2006 model, it was marketed as a Rabbit, using a 2.5-liter five-cylinder engine making 150 hp. The GTI went on sale during the 2007 model year, powered by a 200-hp, 2.0-liter turbocharged direct-injection four-cylinder engine. For 2008, the Golf R32 was re-introduced, with 250 hp and a DSG dual-clutch automatic transmission. Walter de Silva, Chief Designer of Volkswagen Group, described the Golf VI thusly: "It's more accentuated, more three-dimensional than its predecessor, with precisely defined lines and edges, and with finely proportioned flared surfaces and recesses." Generally, this Golf marked a further refinement of the Volkswagen design DNA with its consistent horizontal alignment of front and rear elements. The roof section was now resting on a prominently contoured shoulder section, due to a prominent curving line that runs from the headlights to the taillights. This "character line" gave the Golf VI a heavier and lower profile on the road. 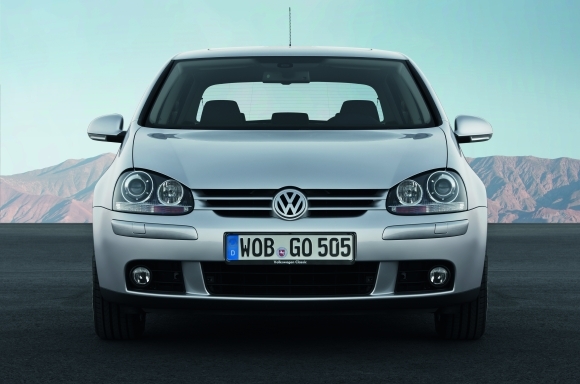 Up front, the Golf VI adopted the horizontally aligned radiator grille between the headlights, just like Golf I. Even if the Golf VI has now been topped by the Golf VII, its outstanding features and design ensure that it will be regarded as one of the most successful compact cars of all time. Including all derivatives, a total of 2.85 million sixth-generation Golf models were made, with 137,003 being sold through March 2014 in the U.S. The U.S. models were offered with three powertrains initially: 2.5-liter five-cylinder engine making 170 hp and 177 lb-ft; a 2.0-liter four-cylinder turbodiesel with 140 hp and 236 lb-ft, with an EPA estimated 42 mpg highway; and the turbocharged four-cylinder engine making 200 hp and 207 lb-ft for the GTI. For 2012, the Golf R was introduced as a limited-edition model with 256 hp from its turbocharged four. One of the key aspects of the new Golf, which is based on Volkswagen’s innovative Modular Transverse Matrix (MQB) architecture, is that its weight has been reduced compared with Golf VI, reversing the so-called upward weight spiral. According to manufacturer preliminary estimates, highway fuel economy has improved by up to 23 percent on European models, depending on the engine. In addition, Volkswagen has equipped the Golf with an entire armada of new driver assistance systems. 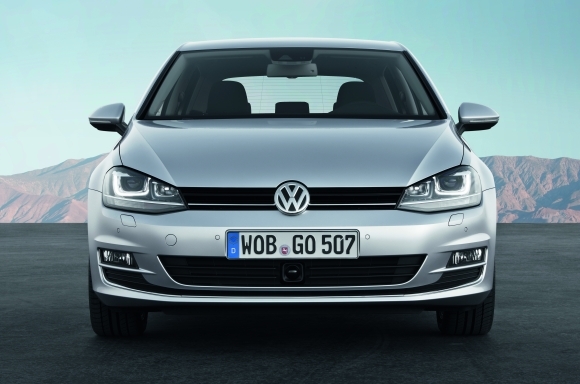 This innovation was rewarded in May 2013 when the Golf was given the prestigious European "Car of the Year" award. Golf VII has more rear-seat legroom and a trunk that is approximately 30 percent larger compared to outgoing model. New technology includes the Automatic Post-Collision Braking System. A new variable-ratio rack-and-pinion steering system sharpens the handling. A standard touchscreen is now fitted in all models and the completely redesigned infotainment systems incorporate a proximity sensor. The latest Golf incorporates elements from past designs, such as the grille crossbar and side window graphics from Golf I and the familiar C-pillar and wheelarches of the Golf IV. This DNA is characterized by functionality, ruggedness, honesty, and reliability. The MQB architecture has allowed for a change in proportions, too. Klaus Bischoff, Chief Designer of Volkswagen Brand, says: "The vehicle cab is shifted backward in visual terms, resulting in the so-called 'cab backward impression’. That's what the proportions of premium vehicles are called, where the hood is long and the cab is located far toward the rear. The new Golf therefore has the type of proportions usually only seen in higher segments." “DSG,” “TDI”, “TSI”, “VW”, “Volkswagen”, “4MOTION”, all model names and the Volkswagen logo are registered trademarks of Volkswagen AG. “VR6” and “Side Curtain Protection” are registered trademarks of Volkswagen Group of America, Inc. “Haldex” is a registered trademark of Haldex Traction Systems.